There are restaurants that merge different worlds of food, but I find Terlingua to be one of the most interesting of those mergers. Taking barbeque and throwing Latin American dishes at it creates in interesting stylistic match up. But Terlingua doesn’t force the issue. You can get one or the other, or if you’re particularly enthusiastic, both. Last weekend, we went for the first time since shortly after they opened, craving all that they offer and bringing a friend along with us. I had it in my mind before we got there that I would order from the barbeque options while my wife and our friend seemed to be inclined toward the Latin flavors. The first matter of business however was to order some drinks. My wife kept it light with a club soda and lime. I took a chance on a new beer, ordering a can of Dogfish Head Seaquench. Our friend went with the Terlingua Sling – mezcal, Cointreau, Campari, pineapple, lime, and house- made grenedine. The food menu wasnt huge, providing a selection of small plates, soup/chili, barbeque, and sides, with a clip on addition of ceviche choices. I knew that I wanted the 1/2 Chicken – house smoked, served with jalapeno cornbread, pickles, and slaw. 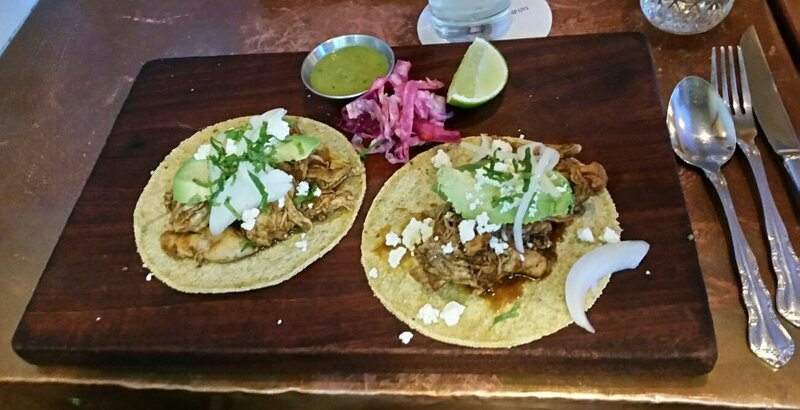 My wife decided on the daily Taco – chicken, onion, avocado, and cotija – and a side of Cornbread. 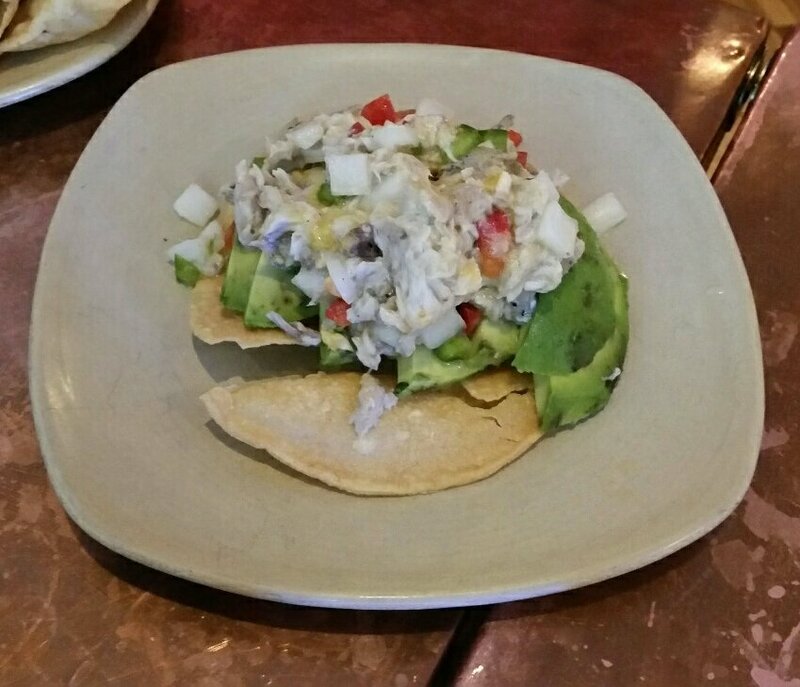 Our friend went with the Smoked Seafood Tostada – avocado, habanero, lime, sweet peppers, and vidalias – and a small Tortilla Soup – chicken, tomato, jack cheese, cilantro. 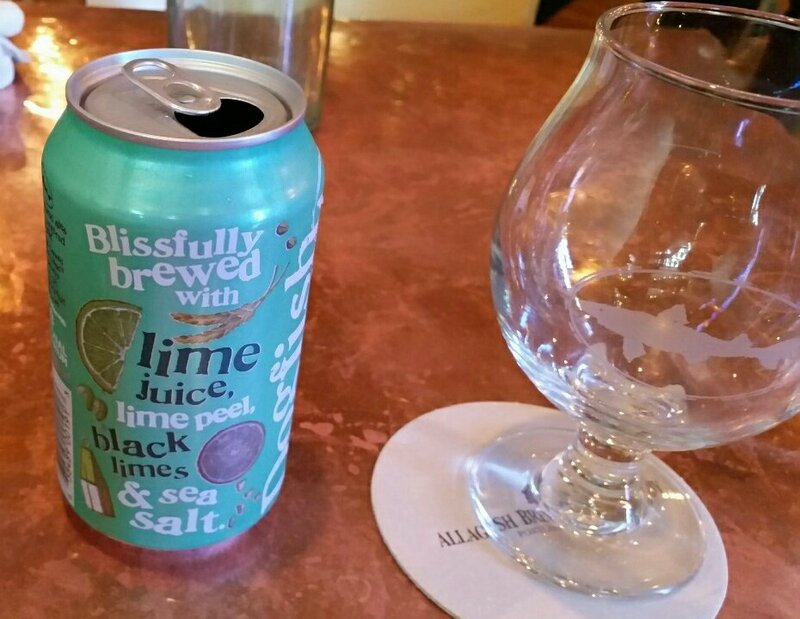 When the drinks came out, I quickly poured my brew in to the glass I was given, noting that it was a session sour brewed with lime juice, lime peel, black limes, and sea salt. That worried me a little as I find a lot of sours to be just too sour. However, I tried a sip and found that it was pretty good – moderately tart with understated hints of the lime. I tried our friend’s cocktail and thought that one was superb with lots of fruit and just a toucch of that magical mezcal smoke. Our food appeared and looked beautiful as I gave it a once over, coveting all of it. My chicken came with two cornbread wedges, a watermelon wedge, two pickles, and a pile of slaw. There was also a little cup of barbeque sauce. My wife had the slaw, a cup of green sauce, and a lime wedge with her tacos. The tortilla soup came with a pile of thick chips. With fork in hand, I started to pick at the chicken. My first bite revealed the pink hue that is occasionally mistaken for undercooking in smoked chicken. Much to the contrary, that pink color reveals the chicken’s reaction to a well-done smoke. Eating that first bite was a joyful moment as the poultry had tons of flavor from both the smoke and seasoning. Sure, I prefer a little sauce slathered on, but this could certainly have been eaten with or without it. After a couple bites of bird, I moved on to the slaw. Long, stringy, and purple, it was good, though nothing out of the ordinary. I really enjoyed the cornbread which was grilled and crispy on the outside. Cornbread is delicious, and adding jalapenos to it in the right manner takes it to another level. This one did it just right, adding a flavorful potency without losing any of the normal cornbread sweetness. For the rest of my meal, I made sure to add some sauce to my chicken and loved the sweet, rich condiment. I remembered it being the same when I was last there, which was a good thing. Our little group seemed to enjoy the experience as we worked diligently to finish everything we had. 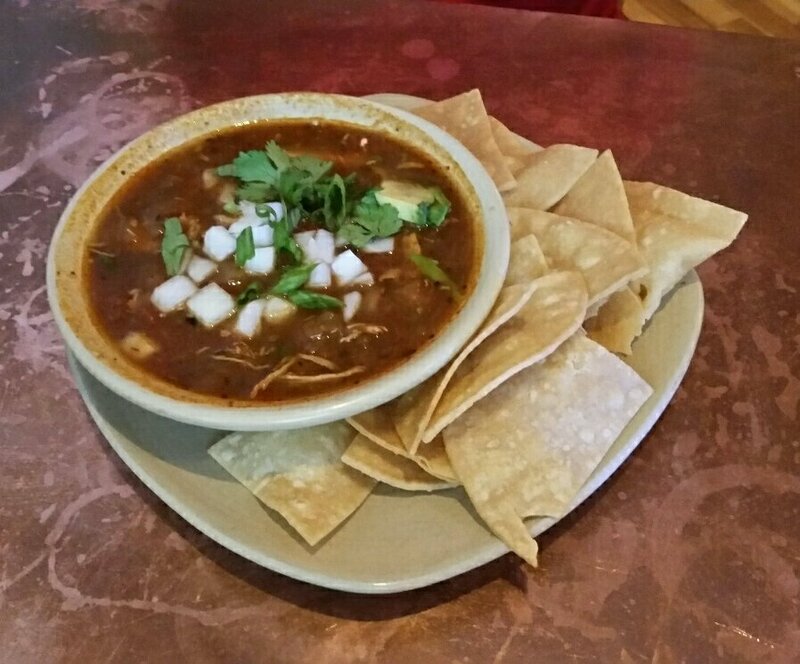 The tacos and tortilla soup were notable favorites. As Mrs. Portlandeater was downing her food, she inquired as to why we didn’t eat there more when it was so good. It’s a fair question. I think Terlingua is going to have to be moved up the list. I like their barbeque a lot, but the Latin American is also super tasty. It’s just really hard to go wrong with anything they serve. On my list of items to try? Brisket, chili, and the Mexican street corn. Our final tab came to 80 bucks plus tip. It was well worth the price and I’ll be paying them a return visit in no time. If you like smoked meats, tacos, marguaritas, and the like, you’ll be a fan of Terlingua like I am. They’ve got a little something for just about everyone. Go soon, because you love great food and they’ve got lots of it. This entry was posted in Portland, ME food and tagged blog, food, peterpeterportlandeater, pppe on September 27, 2017 by peterpeterportlandeater.